Now that you have signed on for the fishing trip of a lifetime you will need to make travel arrangements to Anchorage. Many airlines service Anchorage International Airport so it should prove no different than booking anywhere else in the United States. Plan on booking your flight as soon as possible as summer is the busy season and flights tend to be full. You will not need a passport and flight times from the West coast average around 4 hours. Anchorage.net, the official travel site for the city, has a very detailed breakdown of the approximate flight times to Anchorage from major cities around the world. The site also features information on getting around Anchorage, as well as how to make your way to other places in Alaska from Anchorage. While you’re at it, don’t forget to check out favorite things to do in Anchorage. Cancel for Any Reason (CFAR) is an optional benefit of travel insurance coverage which offers the opportunity to cancel travel plans for reasons other than those listed as “covered reasons” on a policy. CFAR allows you to bypass that list, giving you greater flexibility and freedom when making decisions about travel reservations. You cannot purchase CFAR separately – it can only be an “add-on” benefit. It is offered as a part of certain comprehensive plan and will only be available if you meet certain criteria. If you -meet all the conditions, most of the policies will reimburse you 50 -75% of your trip costs, unless otherwise noted. Typically, a policy must be purchased within 10-21 days of making the initial trip payment to be eligible for CFAR benefits. Often, providers will require CFAR purchasers to insure the entire dollar amount of their travels in order to receive the coverage. Additional requirements may be stated by the providers for those interested in buying a CFAR policy. Be sure to thoroughly read and understand any and all terms before you make your purchase. Often, trip insurance cancel for any reason policies set parameters around when the CFAR period ends and how to notify travel suppliers in the event of a claim. Many CFAR policies mandate that you must cancel your plans and notify any and all travel suppliers at least 48 hours prior to your scheduled departure. Some travel insurance companies have a requirement of cancellation no less than 72 hours before departure. Beyond that window, any cancellation you make must be made for a stated “covered reason” under your policy details. The MH Ross Complete seems like a good option. Includes CFAR up to 75% of trip cost but you must cover 100% of the cost of all travel arrangements for Your Covered Trip that are subject to cancellation penalties or restrictions for this coverage to pay. This policy premium is $2550pp. Here’s one that looks good until you read the fine print. A $10,000 trip with AIG Travel Travel Guard Platinum, the premium was $1,800pp. The CFAR addition will cover only 50% (if certain conditions are met) and is an extra $700pp. So you spend $2,500 insuring a $12,000 trip with a maximum potential reimbursement of $6,000. For shopping multiple options check out www.insuremytrip.com. On Mondays your round-trip charter flight from Anchorage to King Salmon will be on a local air taxi, Katmai Air. We will book those flights for you and that cost is included in the weekly rate. The flight out to the lodge will depart Anchorage at 3:00pm (you will need to check in at 2:00pm), landing in King Salmon around 4:00pm. Katmai Air departs from Lake Hood (4125 Aircraft Drive, Anchorage). They have a free shuttle that will pick you up at the airport and bring you to their office to check-in. You can call them directly when you land and request a pickup, 907-243-0649. Many hotels that offer an airport shuttle will also bring you to Lake Hood. So if you’re staying in Anchorage prior to your trip to the lodge you can arrange a shuttle with your hotel or with Katmai Air. 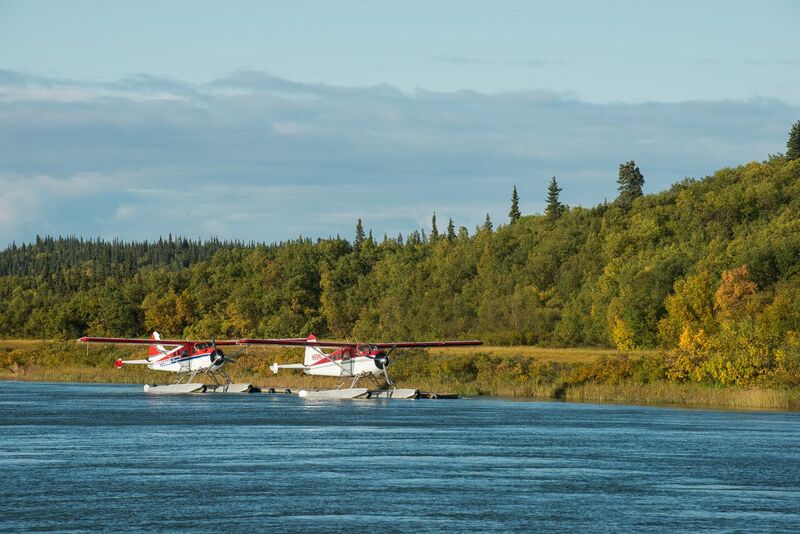 Upon arrival in King Salmon, you will be met and transferred to our float planes for a 30-minute flight to the lodge. Once at the lodge, we will give you some time to unpack and unwind with a cocktail and appetizers before dinner. Guides will be available to evaluate your individual gear needs and get you set-up with any loaner equipment you may need for the week. On the following Monday morning you will fly in our float planes from the lodge to King Salmon. Your flight from King Salmon to Anchorage is included in the trip cost and we will arrange this flight. We recommend booking your return flight from Anchorage no earlier than 2pm to allow for any weather delays. Upon arrival in Anchorage, Katmai Air has a free shuttle that will bring you to the Ted Stevens Airport, or to any nearby hotels. A fishing license is required for everyone and can be purchased online through the Alaska Department of Fish and Game. Everyone 16 and older needs to purchase a 7-day sport fishing license at a cost of $55. If you are coming between June 15th and July 31st, and wish to fish for King salmon, you will also need to purchase a 7-day King salmon stamp at a cost of $30. After you purchase your license online, you will need to print it out to bring with you. Please remember to bring your fishing license with you at all times when on the water in Alaska. We are happy to clean and vacuum pack your catch to take home. Sockeye, Silver and King salmon are considered the best for eating. Chum and Pink salmon, while very fun to catch, are not considered suitable for fresh frozen eating. All other fishing is catch and release. Since the majority of our fishing is catch and release it’s a good idea before your visit to review the best catch and release practices. Click here to watch Katmai National Park’s short video.